On the 6 October 2017, the RNZN Communicators Association celebrated 50 years since its inauguration on the 6 October 1967. The Association celebrated the milestone with a Cocktail Party at the National Museum of the Royal New Zealand Navy in Devonport, Auckland. Seventy-two ex and serving Communicators and their guests attended the event. It was pleasing to note that 18 of those 72 were serving Communicators. The camaraderie between ex and serving members was plainly evident. Click HERE to view images from the evening. There were three Awards made during the evening. ‘Communicator of the Year Trophy’ awarded to recognise outstanding performance in the Naval Communications Trade. The 2017 winner was LCWS Nikita Leeks. Jim Blackburn presented Nikita with her trophy. 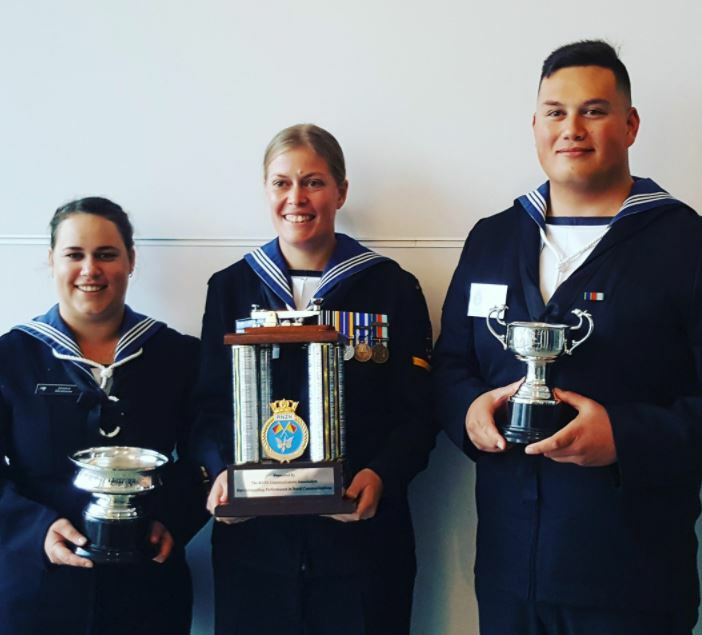 ‘The Ruth Slight Memorial Cup” awarded for the best all-round female Communications Warfare Specialist for the Advanced Training Course. The 2017 winner was LCWS Jessica Abrahams. Jessica was presented with her Award by Paul (Sid) Slight, Ruth’s husband at the time of her passing. ‘The Jim Dell Cup’ awarded to the best all-round Communications Warfare Specialist of the POCWS (Q) Course. The 2017 winner was LCWS Jimmy Motu. Jim Dell presented Jimmy with his trophy. Mrs Laurie Rands was made an Honorary Member of the Association in recognition of her valuable research contribution to the Association. The badge was pinned on her by her husband Frank Rands. The Association would like to acknowledge the invaluable assistance received from Museum staff members Ann Martin-Stacy and ASTD Danni Turnbull leading up to the event and on the night. They made a significant contribution to the evening’s success. A special thanks must also go to Heather Bourke, our caterer and to the members of the TS Leander Sea Cadet Unit ably led by Ensign Sonia Porter and who undertook Steward duties for the event. The evening was a brilliant and fitting way to celebrate the Association’s 50th. Excellent night, well organised and congratulations to the winners. Well done caterers, TS Leander, The Committee and of course to the museum. Had a great night in the camper van in the car park until the alarms went off around 1206. Within minutes loud Naval Patrols with the biggest brightest torches kept us entertained for about half an hour. I notice they did say, loudly, “he is okay, he has approval” – I guess that was us. A most memorable evening, catching up with old friends. I would like to thank the Committee for giving me the opportunity to present the James Dell Cup to LCWS Jimmy Motu – a most deserving recipient. BZ to all concerned. Unfortunately, Vicki and I will not be able to make the Reunion as we will be in Australia attending a granddaughters 21st.